San Rafael, Calif.—Barefoot remains the top-selling table wine brand as sales figures for January indicate steady growth in off-premise channels and overall U.S. wine sales. U.S. wine sales increased 3% to $2.8 billion in January, market-research firm bw166 reported. The increase versus a year ago came during what’s traditionally a slower time of the year for wine sales. The gains ensured that growth in domestic wine sales during the latest 12 months remained steady at 2%, for a total of $42 billion. Sales through multiple-outlet and convenience stores tracked by IRI also gained 3% in in the four weeks ended Jan. 28, totaling $657 million. Case volumes increased 2% to 8,331,238 in the same period. Similar to the overall U.S. wine market, 52-week sales through off-premise channels increased 2% for a total of $8.9 billion. Drilling down into the brands responsible for the growth in table wine sales, E. & J. Gallo Winery continues to beat the market with its popular Barefoot brand. IRI data indicated that Barefoot sold $667 million worth of wine through multiple-outlet and convenience stores in the latest 12 months. 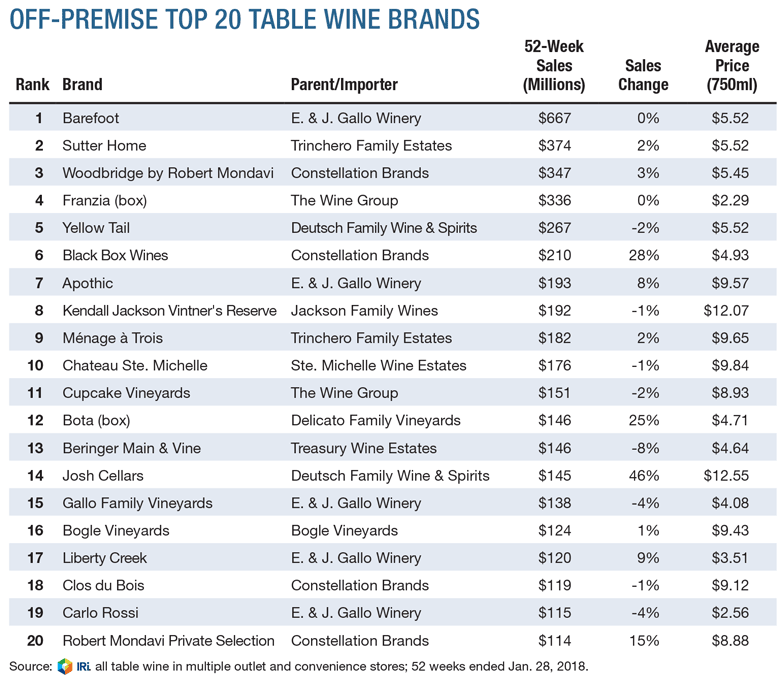 Barefoot’s annual sales not only exceeded total January sales through IRI off-premise channels but were almost twice those of Sutter Home and Woodbridge by Robert Mondavi, the next two table wine brands. The fastest growing brand was Josh Cellars by Deutsch Family Wine & Spirits, which saw sales grow 46% to $145 million in the latest 52 weeks. While the top three brands retail for $4 to $7.99 per bottle, consumer appetite for wines in the $11 to $14.99 category propelled Josh Cellars into 14th place. While the most popular and fast-growing brands come in bottles, box wines continue to enjoy strong growth, notwithstanding Franzia being edged into fourth place by Woodbridge over the past year. Constellation’s Black Box brand posted 28% growth to $210 million worth of sales, while Bota, the box wine from Delicato Family Vineyards, increased 25% to $146 million in sales. The popularity of these premium boxed wines, which sell for just under $5 per 750 ml, has helped support bulk imports. Since last summer, bulk wine sales have exceeded the previous year and posted double-digit growth: 22% in January (to $55 million), and 18% for the latest 12 months (to $2.4 billion), according to bw166. While growth has moderated in recent months, the greater volume of sales reflects the ongoing desire of wine companies to secure supplies in a tighter global market. The strength of domestic sales, driven by value-oriented brands from Barefoot to Bota, adds to demand for juice that keeps wines affordable. How long this continues is another question; as speakers at the Unified Wine and Grape Symposium in Sacramento pointed out last month, rising juice prices are on a collision course with value-conscious consumers. Consumers are willing to pay more to try something new, but it’s more difficult to boost prices on existing favorites. Domestic sparkling wine sales also saw strong growth in January, rising 26% versus a year earlier. This compared to growth of just 2% in sales of domestic table wines. The strong growth for sparkling wines was based on just $9 million in additional sales. While table wines sold an additional $13 million in the month versus a year earlier, it translated into a lower growth rate. When it comes to double-digit growth, the more formidable factor is direct-to-consumer (DtC) shipping. Shipments through the channel rose 25% in January 2018, Wines Vines Analytics/ShipCompliant data showed, nearing $126 million. During the latest 12 months, shipments increased 11% to $2.7 billion. Growth in January reflected shipments of more expensive wines, a fact reflected in 5% growth in average bottle price versus a year ago to $33.82. Regionally, Napa dominated the DtC channel in the latest 12 months, shipping 1,734,189 cases worth $1.3 billion. These wines led in average bottle price, too, at $62.98, a 2% increase from a year ago. However, the most significant DtC gains occurred in Oregon and Washington. Oregon, for example, increased shipments 36% to $157 million on 334,019 cases, while Washington shipments rose 35% to $106 million on 264,102 cases. Growth in value outstripped cases shipped, translating to strong per-bottle price increases. Oregon saw the average bottle price of DtC shipments increase 4% to $39.25, while Washington had the third-highest average bottle price at $33.34. Washington, however, saw the biggest growth in average bottle price of any region over the past year, gaining 5%. Reinforcing the steady growth in sales was strong hiring activity at wineries. WineJobs.com’s Winery Job Index hit 329 in January, up 18% from a year earlier. The growth reflected renewed activity as wineries prepared for a new growing season. Winemaking positions led the increase with 52% growth, followed by 36% growth in sales and production hiring and 12% growth in demand for vineyard positions. Direct-to-consumer roles, including tasting room and retail, and administrative positions saw minor declines.